With content planning, development tasks, client collaboration and design requests pouring in from all directions, your business can easily get buried in projects. It’s no wonder why there are so many project management tools on the market. There are literally hundreds of tools claiming to make planning, managing and completing projects easier, but how do know which to choose? Companies need seamless team workflows, which many project management tools can address. However, there are other needs like easy document sharing, planning and task management features that don’t fit every workflow tool. It’s essential to get your team organized, streamlined and collaborating as efficiently as possible. Without the right tools, you seriously hinder productivity. But that’s why we’re here. We’ve gathered a list of the 23 best project management tools available and sectioned them into categories that are most important to you. Whether you need to better collaborate with clients, work across remote teams or share documents with collaborators, agency project management tools are needed. The problem most agencies have is limiting the number of tools used to increase efficiency and ultimately productivity. Noted as a powerful but simplistic project management tool, Active Collab uses major features like time tracking, task management and team collaboration tools. Brands can eventually grow out of the need for smaller tools and when this happens, Active Collab is the next step. This tool helps take out paper-based approvals, integrates with several third-party tools and gives management visibility into production. All of these features are critical for an agency to stay on top of projects while keeping invoice documentation as well. The seamless workflow helps users set tasks, but without wasting time. Active Collab prides itself on keeping people connected and on the same page. For progress-at-glance capabilities and start-to-finish visibility, Asana is crucial for project managers. Asana is one of the more popular project management tools because of its integrations with powerful third-party tools. If you need Dropbox for file sharing, MailChimp for communication services or Github for development, Asana has you covered. This software organizes big projects into smaller tasks so they can be assigned out to different team members. Asana also allows you to add due dates and progress tracking, so all stakeholders can see where a project stands. Redbooth is a project management tool to help keep employees engaged and on the same page as others through any task. Its real-time collaboration and communication tools help teams of all sizes get work done. This tool provides interactive Gantt charts to help keep projects organized. It’s also a great collaboration tool for agencies needing to interact with clients on the same space. Redbooth lets you reduce email communications by assigning projects to owners. You can then set a deadline for the project, and Redbooth will notify the stakeholder as the due date approaches. Podio provides a central place for tackling common daily tasks such as conversations, tracking sales leads and delivering creative collaboration efforts. This hub helps keep users on the same page with its customizable functionality. It’s easy to put specifics requests on any template so work is done more efficiently. This ultimately reduces the steps to build templates so additional and continuous training isn’t needed. Another great feature from Podio is its overview calendar to see the work at large or single out your own personal tasks. The customization is perfect for agencies needing to customize requests and get everyone in sync. Much like its namesake, the project management tool 10,000ft was built to give organizations a better glimpse at the big picture. Its real-time planning features allow users to see what others are working on so double work is cut and productivity is improved. The roster overview is also important for teams who need to know team availability or if someone is on vacation. Additionally, the project overview allows users to see all working projects, while the schedule provides a visual overview of who’s working on what in the upcoming weeks. The budget and invoice features are also a great addition to teams needing to keep projects at a certain price point. Analytics allow you to see what works best to make sure you improve on future projects. When it comes to scaling productivity and cross-departmental collaboration, workflow project management tools are a must. While the majority of project management tools will fit into the workflow category, there are some who take this type of system a step further. One of the most popular workflow project management tools available is Trello. Its simple design makes organizing and team collaboration a breeze through its column-based system. The whole point of Trello is organization and provides a quick view for users to see the project at glance. This helps users see who’s working on what project, tasks that need to be completed and all available in a single location. Trello is great for working with teams, co-workers or freelancers. Its calendar view is one of the most essential features in the product because it gives users a bird’s-eye-view of when projects are due. For content teams, Trello is ideal to assign, task, communicate and benchmark deadlines in one space. If your biggest concern with managing your workflow is time management, Harvest might be worth a look. This tool has specific start and stop timers to get you and your team through a to-do list. Easily dock hours of work on a project or specific tasks to track your workflow. Harvest also brings expense tracking to the board so you can keep both time and expenses in one place. This tool is ideal for those wanting to equate minutes to dollars. If your projects are costing too much and taking too long, Harvest allows you to visualize progress, set benchmarks, add annotations and see helpful expense information. While ProofHub could easily be in the agency section, this project management tool allows teams of any size to collaborate more efficiently. Specifically, ProofHub is all about organization for better workflow experiences. Its organized structure is built to help teams become more productive and collaborate more efficiently by keep files and documents in one place so nothing gets lost. Additionally, ProofHub stands out with its basic or kanban workflows, proofing process, native group chat and custom role settings that allows different levels of access to people in projects. While most of the tools mentioned here are manual and user controlled, Liquid Planner uses predictive software to organize and schedule projects for businesses. This helps companies focus on the task at hand, easily change projects and oversee the impact of your changes. The predictive software helps project managers estimate time spent on projects as well as understand who’s available for the next sprint with visual capacity charts. We’ve already listed a few project management tools that could be used for personal use. However, there are a couple of tools that are more fit to increase your productivity and organization individually. Whether you need a to-do list, a collaborative notes workspace or the ability to share and take notes on the go, Evernote has you covered. This project management tool is a must have for those who want to keep a workspace across a desktop, tablet and smartphone. Its simple design makes it easy to share notes, organize your own and stay on top of your projects. While bigger tools will provide similar functionalities, many people simply want a more personal space to take notes or create important to-do lists. The Basic free version makes it easy to test out, and for larger teams wanting to scale, the Plus and Premium versions are easy to integrate. Another great personal project management tool is Wunderlist. While the app is often marketed to both businesses and personal use, if you use the app, you’ll quickly understand why some workers live by it. Wunderlist is perfect for creating to-do lists and getting reminders to stay on task. If you’re constantly writing reminders on your hand, Wunderlist will save you a lot of ink. But this tool isn’t just for reminders for your grocery list (although it is pretty helpful for that). Wunderlist’s collaboration tools make it simple to share lists whether you’re in the office or on the go. Additionally, you can use this app to create lists for every project so each member has detailed notes. This provides a clear overview of the task at hand and each person’s responsibilities for a given project. Even though Azendoo is slowly moving away from personal project management features, the tool is still great for individual users. Azendoo has separators that allow users to organize and task different lists into categories for better prioritization. Having the ability to export tasks into Evernote, JSON or CSV files makes this a great tool for sharing tasks with others, even if they don’t use Azendoo. While it can be used individually, Azendoo is great for team collaboration as well. If you’re looking to try it out solo before you integrate an entire team, this might be a good introduction tool for you. Possibly the best tool for agile development teams is JIRA. This tool was built for teams to plan, track and release projects while keeping tasks, documents and users all in one central location. Additionally, JIRA’s flexible Kanban and scrum boards make it easy for teams meeting in daily stand ups and for those who need an overview of tasks assigned to specific users. What makes JIRA so simple is its ability to get to any space in the project lifecycle. For designers and developers alike, this is critical to see the project at a high level view or dive into the nitty gritty. If your team is struggling with planning the right amount of work for each team or even individual, JIRA helps teams plan in epics and sprints with flexible tasking tools. Basecamp is built to help teams leverage different project management needs into one place. This tool is a single organized place for communication to reduce emails, chat messages and sending files across platforms. While it doesn’t have the agile, scrum and Kanban features for developers, this tool can be used for design teams needing to stay on the same page. Its project management message boards make it easy to reduce emails by showing the entire progress of a task in one space. Additionally, the to-do section lets you assign users and give deadlines so you don’t have to constantly bug your teammates. Wrike is an organizational project management tool built to help dissect large tasks into more controllable segments. The tool provides live editing and file management so users can see changes in real time and easily share important documents. Its Gantt chart structure provides a visual timeline for your project to improve scheduling tasks and on-the-go adjustments. Like other tools mentioned, Wrike has time and budget tracking to ensure the right amount of time and money is spent on each project. Its personal dashboard makes it a great space to manage your own work, but the communication, proofing, approval and live activity stream features are extremely valuable for small or large design and development teams. Workfront is a powerful and centralized project management tool for IT teams, developers, creative teams and more. The whole purpose of the tool is to keep projects in a single working space. You’ll commonly come across the phrase “working at the speed of digital” on their site, which is exactly what Workfront is set out to do. The tool makes it easier get projects done at lightning speed with the help of features like its transparency reporting. This helps people prioritize requests and keep users informed to make better decisions. Other features allow users to work between different project management styles such as Agile and Waterfall, to collaborate across departments without harming productivity. Workfront provides a plethora of data and reporting features to make sure you hit goals and improve on future projects. Managing content from the writing process to editing and then to approval can be cumbersome for certain companies. That’s why so many content teams look for project management tools to make the content creation process easier. Without using a project management tool for your content, errors occur, prioritization is lost and projects get bottlenecked. Content teams often work with several other departments in your business so finding a way to keep everyone on track and streamlined is critical. DivvyHQ is a content management tool that helps businesses focus on and simplify the front half of the content creation process. This tool allows brands to zero-in on strategizing content, ideating, planning and producing. The goal is to help content strategists get all their ducks in a row before moving on too far down the publishing line. The unique platform has features to create various content calendars for each team’s needs. DivvyHQ helps teams visualize due dates, completion dates and what team members are working on at the moment. Again, this tool is all about simplifying day-to-day tasks for content marketers. It’s easy to set custom workflows, which then automate assigning tasks from a drag-and-drop feature when adding new content. Content can be created in DivvyHQ and assigned for review and approval. Mintent is a content creation and project management platform that helps businesses deliver content for different areas of your buyer cycle. The tool was created to limit mass spreadsheets, lost files and large email chains in the content creation process. Creative users get a more structured approach to projects by accessing briefs, buyer cycle info and overall themes to make content product easier. Other features from Mintent include custom workflows for easier assignment and a content calendar that gives an overview of everything being worked on or published. Curata helps brands understand and analyze what content works best with the various marketing stages such as: lead generation, shares and sales impact. Some features included let users plan, produce and collaborate across a customizable editorial calendar. If you’re looking to improve your editorial planning and team collaboration efforts, Curata has the tools for your organization. Additionally, auditing features allow brands to pinpoint the gaps in content strategies. Content workflow templates allow users to balance content request and tasks with an easy dashboard built to make the distribution process painless. Widen is a digital asset management tool to let brands organize, analyze and improve content strategies by bettering each step in the content life cycle. Additional tools help users analyze how their assets are used to improve new content projects down the road. For example, Widen’s Workflow feature lets design and content teams request, assign, review and approve projects. This helps managers request projects and allows designers, content producers and other creatives to start the project. Getting your content management, developer sprints and overall workflows organized is certainly a high priority. But you should also worry just as much about your social team’s organization, management and ability to converse with customers. Sprout Social is a social media management platform built to help brands streamline workflow across social media platforms. While many would consider Sprout to be more of a social media dashboard or management software, there are many aspects of a project management tool here. In fact, Sprout provides a simplified all in one Smart Inbox where different users can manage, tag and filter workloads all in one place. Whether you’re managing multiple social media accounts or need to create a better audit trail in your social efforts, Sprout is the tool for you. 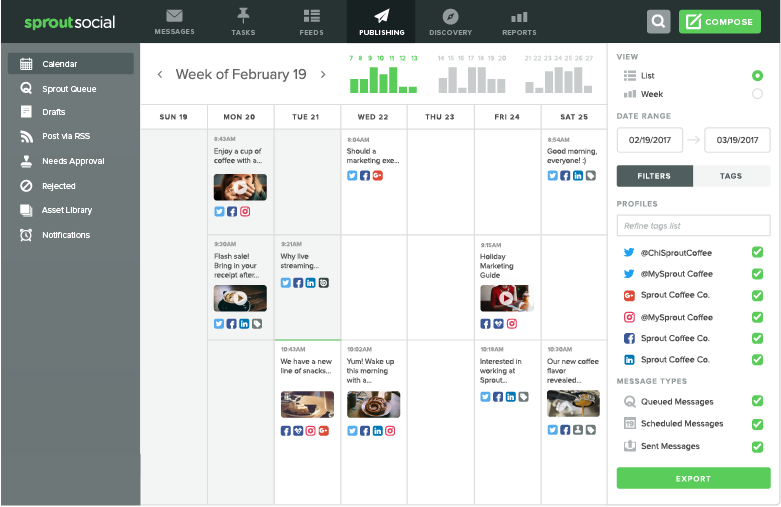 Additionally, Sprout’s social media calendar provides visibility into posting schedule and different campaigns. It’s also easy to view tasks on the team or individual level, so users can complete tasks in more efficient and streamlined process. Our Team Collaboration tools let users assign incoming messages as tasks for different team members so you can identify sales leads, assign general tasks or create Helpdesk support tickets from any social message. Try us for a free 30-day trial to see what Sprout can do for your business! ContentDJ is primarily an editorial content calendar platform to help marketers all stay on the same page. What makes this tool unique to social media project management tools is its content curation feature. This tool allows marketers to integrate ContentDJ with other major content tools like MailChimp and WordPress. ContentDJ helps users curate top content for the week so it’s easily publishable to your email list or social channels. Its social calendar feature also allows users to manage, approve and curate the workflow of your social media content. CoSchedule is a marketing calendar platform that can help brands organize their social media content all under one roof. In fact, CoSchedule works just like a project management tool to help end massive email threads, bottleneck workflows and various tools across departments. This organizational tool allows users to move projects ahead with customizable team workflows to ensure prioritization and efficiency. It’s social media scheduling features connect directly to your calendar so you can keep your social content in a single space. Have any project management tools you love to use? Hit us up in the comments below or reach out to Sprout on Twitter!